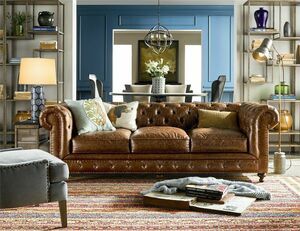 The retail furniture market in the U.S. as of 2016 was worth over 111 billion dollars. That's 6 billion more than what it was worth in 2015. Those numbers shed light on the fact that more Americans are looking to punch up the visual impact of their home decor. Over the last couple of years, one of the hottest trends for furniture in bedrooms has been rustic modern style. Modern rustic bedroom furniture takes all of the elegance and usability of the modern school of design and combines it with the outdoorsy, natural look of rustic. The result is the marriage of two styles that seem like they would conflict but together, offer your room a unique look that pops. When considering how to go about purchasing modern rustic bedroom furniture there are a few factors buyers should consider before committing to any particular piece. 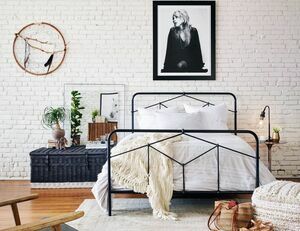 This post aims to offer guidance on what modern rustic bedroom furniture is and how to find the right piece for your space. At the core of the rustic movement is simplicity. Simplicity is showcased in the form of exposed wood and other natural elements. Wood can feel even more serious in its simplicity by opting for an "unfinished" look. Simplicity works well in bedrooms given that sleep spaces benefit from lack of complexity. To that end, when browsing modern rustic bedroom furniture, shop with the mindset that less is more. A simple, unfinished wood bed backboard says rustic. Having that wood finished a dark, sultry color like a dark gray or charcoal says modern. When trying to enjoy the benefits of rustic pieces alongside a hit of contemporary, color can act as the element that bridges those two styles. There is no denying that wood and rustic are synonymous. Other natural elements can be every bit as effective though. Iron, for instance, is 100% at home in a modern rustic bedroom. An iron bed frame that has interesting patterns can be reminiscent of a middle American, old fashion cottage. It can also make your bed pop amidst other wooden furnishings such as drawers or a bookshelf. Modern rustic is a mashup that aims to create something unique through synergy. The fact that the style is a hybrid at its core gives license to experiment with pieces that seem unconventional in a rustic space. Modern rooms feature space between furniture pieces and an almost sterile motif. Rustic strikes a completely different tone. Rustic captures a country feel that's cozy and welcoming. Being aware of both of those conflicting ideas and incorporating hints of them in a bedroom space will help guide a vision that can lead to a space that embodies both contemporary and rustic. When looking for the natural beauty of rustic style in a bedroom but not wanting things to feel dated, adding contemporary elements such as a modern nightstand or leather accent chair or pieces that have brass or bronze metal colors included can produce a desirable result. To create the ultimate modern rustic space, make use of wood pieces, darker colors in accent furniture and be open to experimentation. There are few furniture stores that offer furniture that embodies rustic modern furniture design. Among those that do, Zin Home stands out. 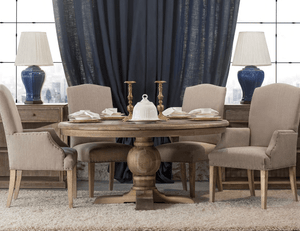 Zin Home offers high-quality furniture pieces that suit all tastes in styles. We also have stellar customer service and are on call to help shoppers. For more general information on decor, read more on the Zin Home blog. Check out our most favorite bedroom furniture sets below and let us know what you think. Reclaimed materials deliver depth to streamlined shaping. Rustic woods finished in saddle tan color maintain their natural knots and graining for a richly organic look. Slim brass legs, brass lamps, modern art work and mid-century modern upholstered chair add a touch of trend-forward modern design to this rustic modern bedroom decor. Modern shapes, rustic materials. Reclaimed character woods are weathered to a lovely grey and finished with a soft hand. this rustic modern design comprises durable reclaimed wood furniture, shagreen end table, mid-century modern accent chair, bold masculine art work, arched mirror, handsome decor and fresh greenery. Cleanly structured and character rich. A light taupe stained pine reveals natural graining for an organic look with rustic-industrial allure. Iron banding adds subtle modern edge. The wood’s taupe finish provide striking contrast to Elle Taupe Reclaimed Wood Queen Platform Bed’s floating iron base frame. 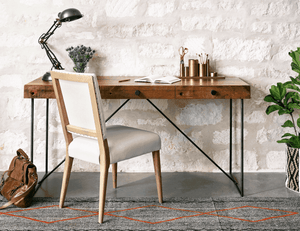 Modern Area Rug and geometric bed side tables complete the rustic modern look. Inspired by mid-century modern design, sleek, squared-off shapes are offset by dark, distressed finishes and accented with antiqued brass hardware. A floating iron base lightens the depth of rich, grey-finished oak, as clean lines lend a tailored look to warm rustic tones. Our Alexa Industrial Modern Iron & Oak Wood Queen Platform Bed adds style to any modern bedroom decor. A tribute to clean, contemporary design, the classic canopy frame delivers style from all angles. Oak's shale grey finish adds warmth to open, modern structure. Low profile platform design for modern appeal.